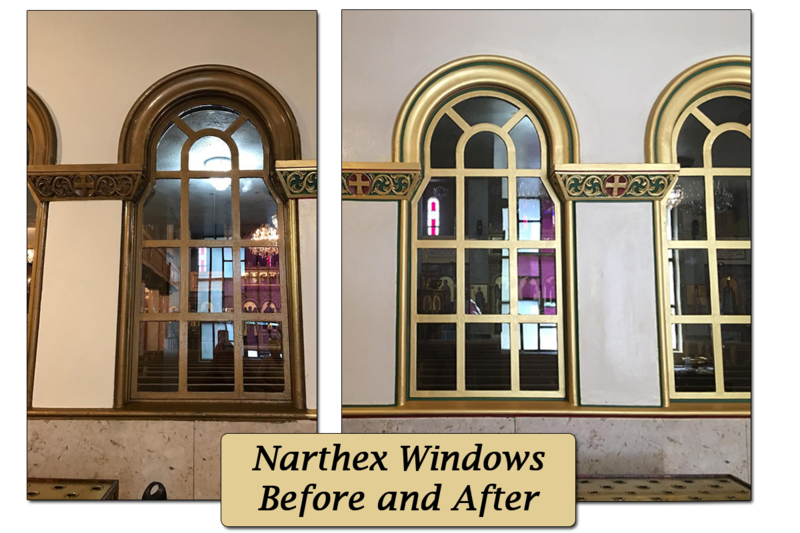 In April 2016 the Parish Council undertook the much needed and ambitious task of the complete restoration of the interior of our exquisite Byzantine church. 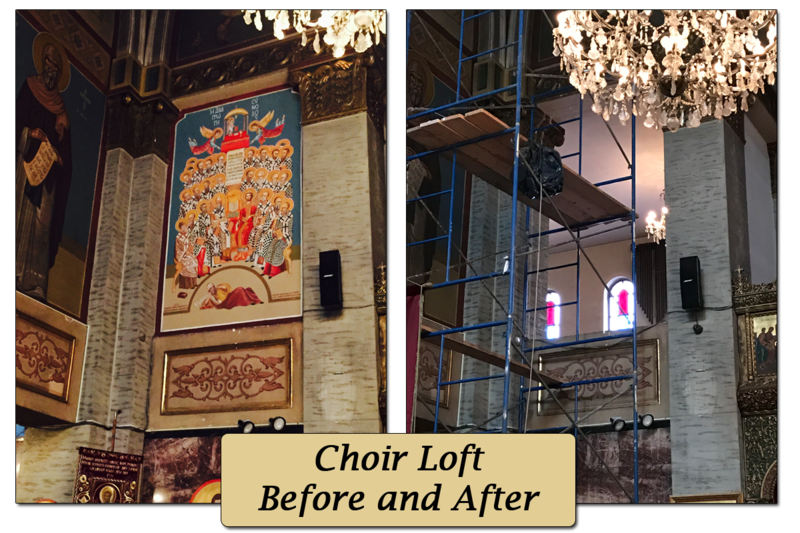 Every effort was made to restore the historic Temple of the church, especially its iconography, in a manner consistent with the workmanship and style of the original artwork. 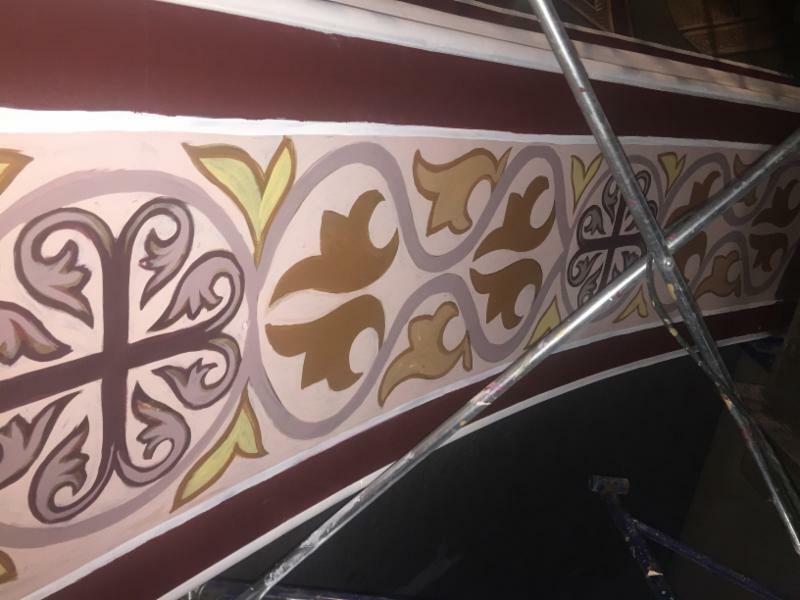 Tremendous efforts were made to ensure the use of techniques and methodology that result in authentic colors and tones, with as little impact as possible on the original, to bring it back to its former glory. 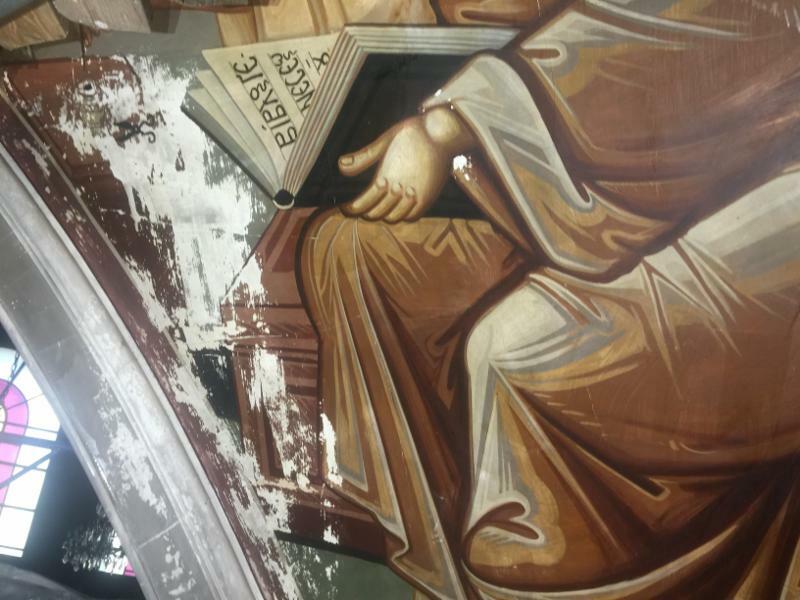 The iconographer commissioned for the restoration project was Mr. Miltiadis Afentoulis. The restoration project was divided into three phases. Phase 1 focused on the altar frescoes, the side aisle icons, the iconostasis and the narthex. Over the years, the icons and frescoes were covered with dust from the city’s polluted air, smoke from the candles and the censor, etc. It was essential to very carefully remove this layer of black residue in order to rediscover the brightness of the icons. The iconography had also suffered some wear and tear. The focus here was not only on cleaning but also fixing the damaged pieces, sometimes with gold, sometimes with paint, but always with a profound respect for the original. For several months, church services took place in the middle of the nave due to the presence of scaffolding in the sanctuary. Phase 2 was particularly challenging because of the scaffolding installed in the middle of the church. A platform covered the entire space above the nave. On the top of the platform was built an enormous scaffold that made it possible to reach the top of the dome, where the Pantocrator and Prophets are located. This provided access to the entire wall: the four triangles with the Evangelists, the fresco of the Annunciation above the Platytera, the North and South arch walls, etc. This was when the most dramatic transformation occurred. Here, the work went far beyond cleaning and repair. The concrete of the windowsills had to be replaced due to water leaks. 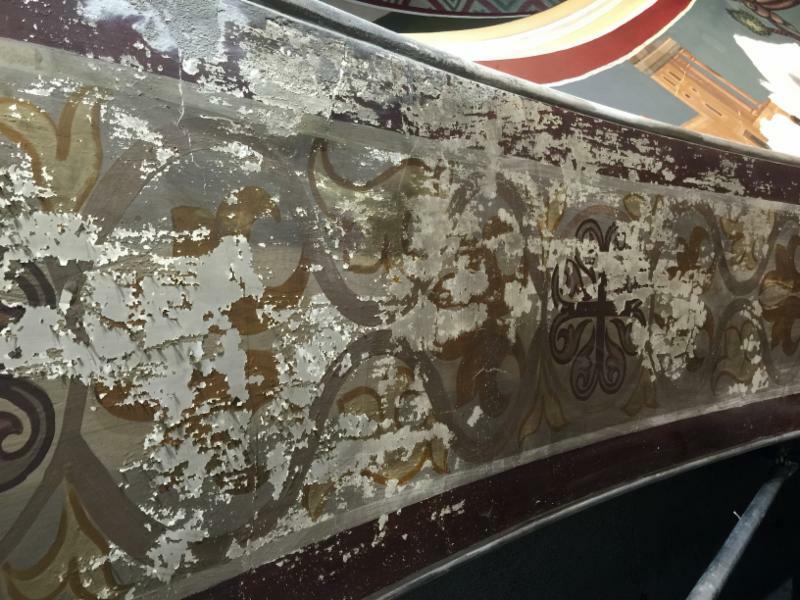 A large portion of the iconography was severely damaged, particularly the four Evangelists, under the dome. 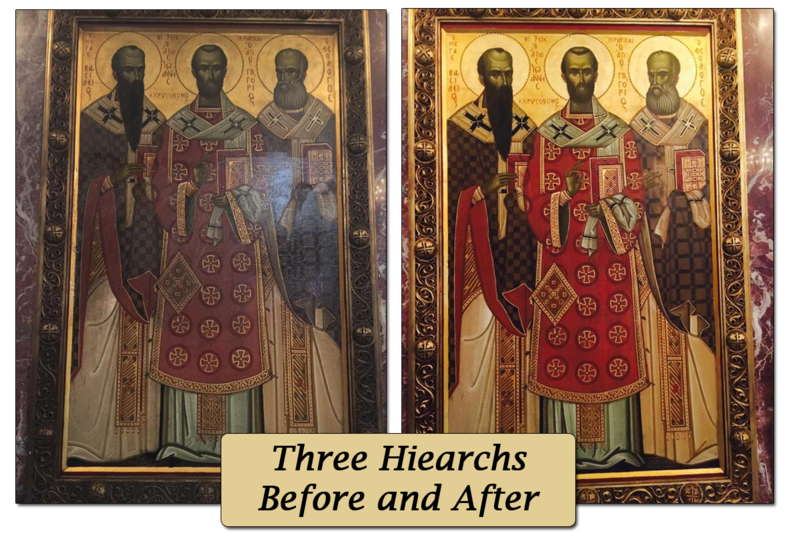 The iconographer had to recreate the sacred images by perfectly matching the original colors and forms, so it is impossible to tell where the original stops and the restoration starts. The four large Maria Theresa chandeliers were also cleaned. Phase 2 was completed just before Palm Sunday 2018 and the scaffolding was gone before Holy Week and Easter. During Phase 3, we focused on the balcony of the church. Parts of the Phase 2 scaffolding were transferred to the balcony. Contrary to what one might think, this Phase was also extremely challenging due to the very precarious quality of the walls after many years of water damage. The decorative ornamentation was the subject of careful attention. The simplicity of the ceiling with its gold stars offers a luminous environment that radiates throughout the whole church. Major window repairs were also done in the dome as well as in the balcony. 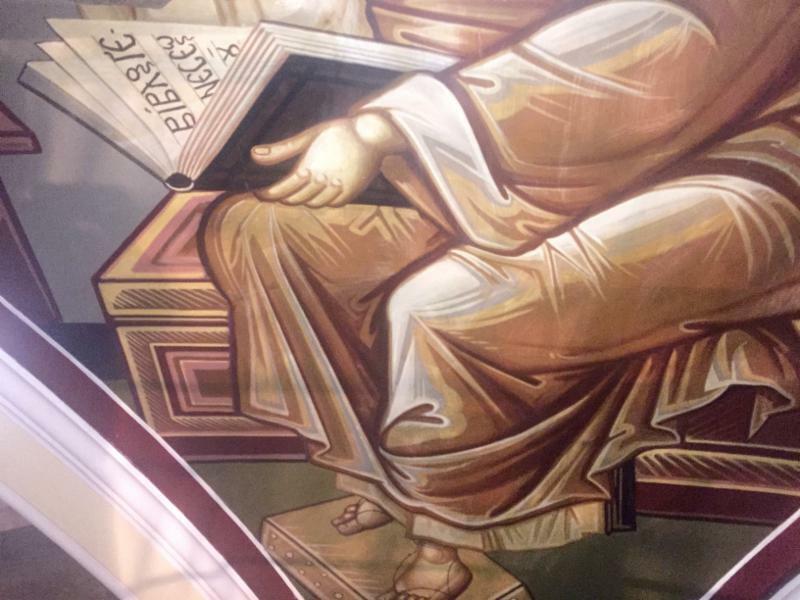 We are blessed to have witnessed the transformation of our beautiful church and to have rediscovered the priceless works of the famous iconographers and artists that adorn the church, including Georgios Gliatas, a student of Fotis Kontoglou Nicholas Stratoulis, Constantine Youssis, Demetrius Pelekasis and Nicholas Engonopoulos. The series depicting the life of Christ on the iconostasis is the only Byzantine work Engonopoulos has ever done. 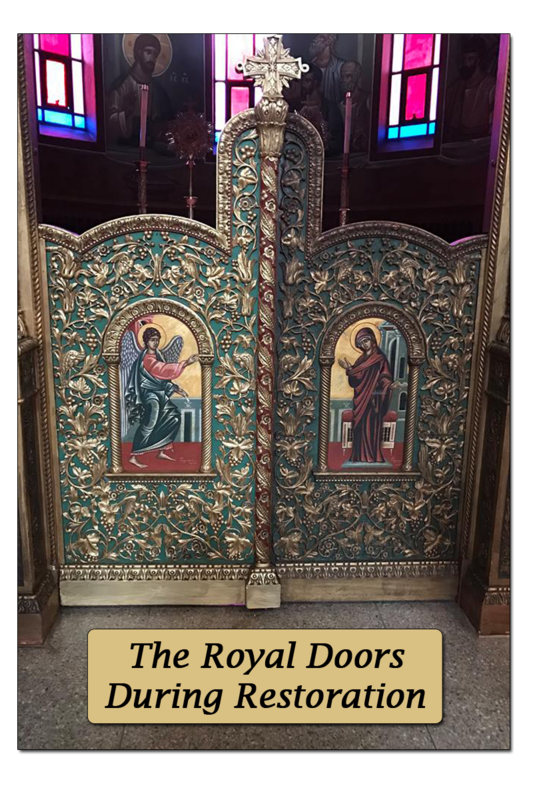 When entering the church, visitors will be moved and inspired by the beauty of the iconography, the radiant expression on the sacred images and the magnificent iconostasis! 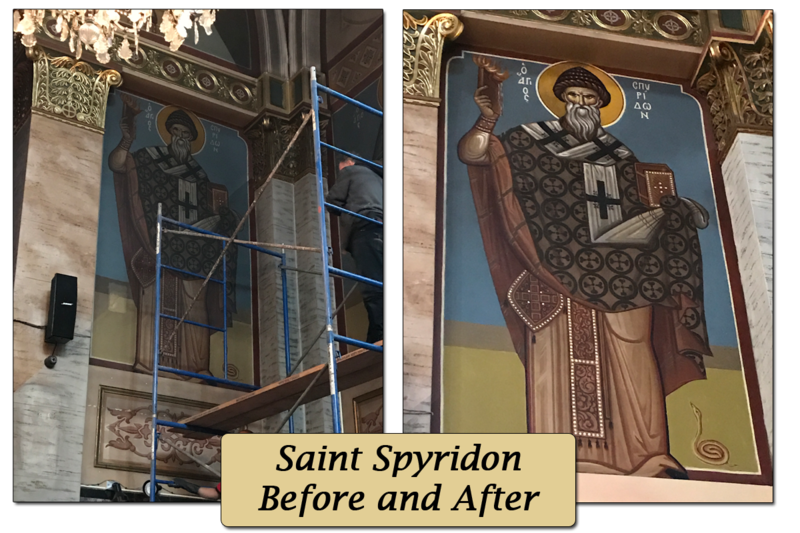 We thank the parishioners, alumni, families and friends of St. Spyridon who helped us raise the money to make this restoration a reality. Your donations helped us complete this crucial ministry of the church to preserve and promote our Greek Orthodox heritage in this beautiful country. Wishing you an abundance of God’s blessings and Thank you! Donations may be made by check or by credit card. All donations are tax deductable. Donate here via Paypal. If you would like your donation to go towards a particular icon or area of the church, please specify on the donation form.